The plastic shut-off dampers made of PVC, PP, PPs, PE, PVDF and GFK Liner with inflatable sealing are tight valves and suitable for the regulation and shutting of aggressive media. 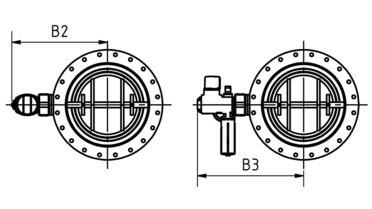 The ventilation valves are clamped alternatively between flanges and installation length acc. Customer request. 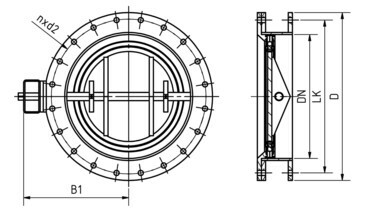 left: with pneumatic actuator "double acting"
Before the disc opens, the control pressure is reduced, thus the sealing elements are squeezed off when moving the disc, in order to minimize the abrasion and friction of the disc. By using this process, the service life of the sealing is highly enlarged. In case of using media tending to caking, the sealing can be sucked back to its original status by means of vacuum technology. Due to the combination of pneumatic drive and central control, the damper stop up liquids or air by pushing a button, in order to start maintenance works on washers. Thus, the down time of the production is minimized.